Improved constructions, 16 slots securely in natural way to dry dishes, cups and kitchen utensils. Two levels self supporting racks for maximum capacity. Fold up quickly for easy storage and save space. Backed by Surpahs 100% satisfaction guarantee program. 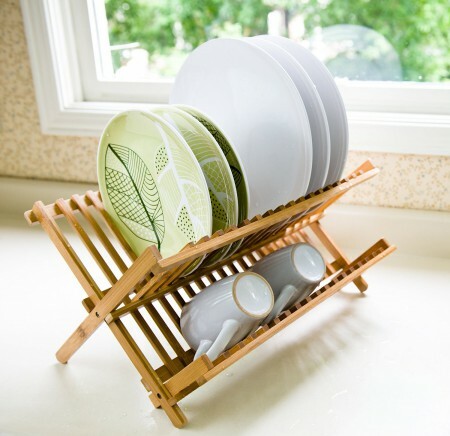 Made of eco-friendly natural bamboo, allows your clean dishes to dry thoroughly. The top rack space for up to 16 dinner plates. The bottom additional rack is for cups, glassware, pots or utensils. It can fold up for easy storage when not in use. Harder and lighter than maple. Less moisture absorbency than traditional hardwoods.